September 7th is National Acorn Squash Day. If today’s weather is to warm for roasting, plan to make it on the next cool day. You can serve stuffed acorn squash as a first course, or as a main along with a protein and a green vegetable or salad. This recipe is from USA Pears, which has many recipes on its website. 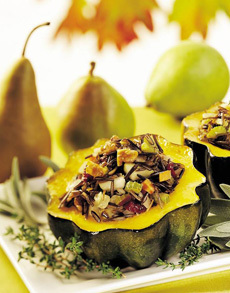 Baked acorn squash is stuffed with wild rice, nuts, fruits and herbs. Photo courtesy USA Pears. 1. PREHEAT the oven to 350°F. Toast the nuts to bring out their full flavor. Place the nuts in a single layer on a rimmed baking sheet and bake in a preheated 350°F oven until lightly browned, about 5 to 8 minutes. When the nuts come out, the squash goes in. 2. CUT each squash in half crosswise. Scoop out and discard the seeds and strings. 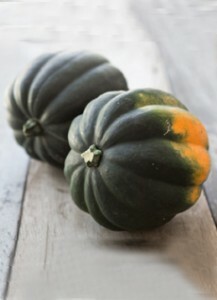 If necessary, trim the top and bottom so that the squash will be level, and place on a rimmed baking sheet, cut side up. 3. SPRINKLE each half with a little salt, pepper and nutmeg, to taste. Dot each half wit butter, using 3 tablespoons. Cover the pan tightly with foil and bake the squash just until moist and tender, about 45 minutes. The first acorn squash of the season. Photo courtesy Good Eggs | San Francisco. 4. COMBINE the rice, broth, salt and water in a medium saucepan. Bring to a boil over medium-high heat. Reduce the heat to a low simmer, cover and cook, stirring occasionally, until the rice is tender, about 40 minutes. When the rice is done most of the water should be evaporated. 5. HEAT the olive oil in a 10-inch sauté pan over medium heat. Swirl to coat the pan and sauté the onion, garlic, celery and carrot until slightly softened, about 3 minutes. Add the pears and sauté 2 minutes longer. Cover the pan, adjust the heat to medium-low and cook the vegetables until crisp-tender, 3 minutes longer. Add the sage, thyme and parsley and sauté 1 more minute. Remove from the heat. 6. COMBINE the cooked rice, sautéed vegetables, pears, walnuts, and dried cranberries in a large bowl. Taste and add salt and pepper as desired. Mound the rice mixture into the squash halves, dividing it evenly. Cut the remaining tablespoon of butter into small pieces. Dot each stuffed squash with butter. Cover with foil. Bake until heated through, about 20 minutes. Acorn squash (Cucurbita pepo var. turbinata) is a member of the Cucurbitaceae botanical family, which also includes cucumber, gourds, other winter squash (including pumpkin), summer squash (including zucchini and yellow squash) and watermelon. Known for its acorn shape, hard green skin (often with a splotch of orange) and deep, longitudinal ridges. Inside is sweet, yellow-orange flesh. While the most common variety is dark green in color, newer varieties have been developed, including the yellow- and white-skinned varieties. Acorn squashes typically weigh one to two pounds and are between four and seven inches long. Before modern refrigeration, acorn squash was a hardy variety to store throughout the winter. It kept for several months in a cool dry location, such as a cold cellar or a root cellar. Acorn squash are indigenous to Central America, and were cultivated by pre-Columbian natives (Mayas, Aztecs and their predecessors) as long as 8,000 years ago. Initially, only the seeds were eaten since the flesh was considered too hard. The flesh layer at the time was much thinner than modern-bred varieties, so not worth the trouble. Today, it is flesh that is prized and the seeds that are typically thrown away! Squash traveled north and across what is now the U.S., where it was cultivated and highly prized. The seeds were dried for eating during lean times, or as portable food for travelers. Squash became a staple of colonial gardens. Both Washington and Jefferson, among many others, grew squash on their plantations and farms. Today, while other Colonial garden items have come and gone (horehound, lovage, orach and peppergrass, purslane, sea kale and others), squash remains on the popular vegetable list.